The Sierra Nevada Mountains are known for their alluring beauty -a scene that creates the perfect setting for wilderness adventures and endless family and individual fun. The rugged terrain is ideal for thrill-seekers who love hiking, biking, and skiing, three of the most popular outdoor activities in California. We'll take care of finding a place to stay, but finding the right trail during your stay can be more difficult. We know that vacation and traveling should't be stressful, so we sought out the best trails in order to help you get the most out of your adventure. A great place to start searching for biking and hiking trails is a trails database called mammoth trails. 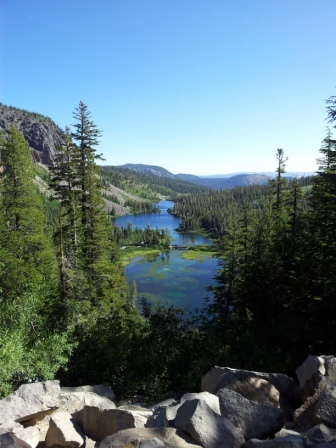 Here you can find detailed information about the trails around Mammoth Lakes. Trail difficulty, length and accessibility are all included, making it a quick search to find what you're looking for. The map feature makes it easy to find trails within a close distance from where you are staying, something valuable in a vast landscape. Another great site for locating trails is the National Geographic sponsored site, AllTrails. This has a similar setup to the previously mentioned site, yet is more user-friendly in that it allows users to add reviews and pictures. Mammoth Mountain Bike Park is the largest bike park in the Western United States, with 80 miles of mountain paths. Open to the public, the bike park is great for all types of bikers; young and old, experienced and novice. The variety of trails makes it a popular spot for families and groups. For visitors seeking a colder adventure, mammoth mountain has 3,500 acres of terrain available for skiing. Mammoth Mountain ski resort is the premier ski resort in the area. It offers up 150 named trails with a whopping capacity to send 50,000 skiers down its slopes every hour. The mountain also provides camps, lessons and dining facilities. Mammoth Moutain has an endless amount of fun and adventure to explore, including hiking, biking, and skiing trails. Contact us to find out more about real estate in Mammoth Lakes, and start your Sierra Nevada adventure today.